Don't discrimi-hate on my delicious cake just because it looks like Barney! We’re eating fudgy, moist Earl Grey chocolate layer cake filled with lavender ganache and frosted with cream cheese icing. On my other website, FoodPornDaily, I often get email requests for the food featured in the daily images. An old one that I still get requests for is the Earl Grey chocolate cake. There is something magical about the way that Earl Grey tea combines with chocolate to make a mildly floral yet roasty fudgy flavor that my tongue just can’t get enough of. And seriously, I’m not a chocolate lover. Don’t get me wrong – I’m not a hater either! It’s just that I can either take or leave chocolate. I never crave it but if it appears in front of me in a delicious dessert, I’m not going to say no to at least a bite. This cake appears to be the exception… I find myself craving it every few weeks…but I’m gonna blame that on my deep-seated love of Earl Grey tea. Preheat oven to 325 degrees. Grease two 9-inch cake pans with butter then line the bottoms of each pan with a circle of parchment paper. Set aside. Place butter and tea powder into a small sauce pan over low heat. Cook for 10 minutes until the butter has melted and the tea flavors have infused into the butter, stirring occasionally. Remove from heat and let cool for 10 minutes. While the butter is cooling, place the cake flour, cocoa powder, brown sugar, baking soda, baking powder and salt into a large mixing bowl or bowl of a stand mixer. Whisk to combine evenly. In a separate bowl, beat together the eggs and buttermilk. Add buttermilk mixture and the cooled tea-infused butter to the bowl with the dry ingredients. Whisk or beat until just combined. The batter will be slightly lump and that is okay. Do not over work the batter or the cake will be tough and dense rather than light and fluffy. Bake cakes at 325 degrees for about 30 to 35 minutes, or until a toothpick stuck into the center of the cake comes out clean with only a few crumbs but no batter. Cool on a rack for at least one hour. To remove cakes from pans, run a knife around the edges of the pans to loosen then place a plate over each cake pan and invert onto the plate. Peel off parchment paper and discard. Place one cake onto serving dish. Tuck strips of parchment paper under bottom edges of the cake to protect the serving dish from getting messy while frosting. Evenly spread the ganache over top of the first cake. Place the second cake over the ganache bottom layer. Evenly spread cream cheese frosting over the top and sides of the cake. For best results, use an offset spatula. You may not use all of the frosting. Once frosted, carefully remove and discard the parchment paper lining the bottom of the cake. The cake can be stored, covered, at room temperature for up to 12 hours before serving or refrigerated for 2 to 3 days. Place chocolate and sugar in a heat proof bowl and set aside. Heat cream to a simmer in a small saucepan over medium heat. Pour simmering cream over chocolate-sugar mixture. Let sit for 60 seconds then whisk until all chocolate is melted and the ganache is shiny and smooth. Add lavender extract and stir until incorporated. Let chill for 20 minutes, until thickened slightly, before using as a filling for cake. Place all ingredients into a large mixing bowl or bowl of a stand mixer. Beat at medium speed until smooth, scraping down sides of bowl as necessary. Cool, thanks for posting. A very nice fellow blogger is getting married in November and I’ve agreed to make the cake (in the shape of a mountain, no less!). There was mention of an earl grey chocolate cake, something I’ve not tried, so maybe this will be the first recipe that will christen my new oven when I move house! Oh my gosh! Thank you for the shoutout! I can’t tell you how excited I am and I kind of feel semi-famous, lol. I re-pre-ordered your book from barnes and noble also – so excited!!! Been following your wonderful blog for a while, but this is my first time commenting. I can’t wait to try these. They look simply delicious! omg, you’re too funny! I once made a lavender shortbread that I tried really hard to like… but it tasted like flowers. I don’t really care for that flavor much at all!! I’d def make this and nix the lavender altogether. I always get a little tear in my eye when you make dessert, because unlike you, I LURVE THEM and your semi-savory twist on them. This (minus the lavender, bc like you, I don’t like eating a bouquet) sounds awesome. And it doesn’t look like Barney. Add some green frosting, and then we might have a problem. I love Earl Grey in baking. That little bit of floral it lends is just heavenly. oh yeah, that’s what i’m talking about. gotta try this. well done. Hi! Exciting recipe. Just one clarification. Do wee need to strain the ground tea leaves from the butter??? Can’t wait to try some of your recipes! I tried this recipe for my boyfriend’s mom’s birthday on November 1st, and it was a huge hit! I tried it with the lavender ganache and that went perfectly with the earl gray. She ended up taking this recipe from me and gave it to all of her friends! I tried this last week (minus the lavender extract, mostly because I couldn’t find it anywhere), and it is my new favorite cake. And everyone else who tried it agrees! Cheryll’s boyfriend’s mom (see above) passed this recipe along to me, and I made it for my daughter’s 30th birthday party. I doubled the cake batter and ganache, and only used one recipe of the cream cheese icing (white, not purple). Everyone loved it and I turned them onto this website. I did use the lavender. I think I’ll make it when my lavender is in bloom and use ground buds, and change it up–maybe cut back on the tea, as it is a very strong flavor, or put vanilla rather than cocoa in the batter. Can you suggest me if i dont wann to use eggs thn whts the other thn dat i can use.?? Looks excellent, I can’t wait to try this. A suggestion that might cut down on the intensity of the lavender in the frosting – you can infuse powdered sugar by sealing it in a bag overnight with lavender buds (crushed for more flavor). Just sift out the buds when you’re ready to use. I’ve done this for lavender shortbread cookies, I love the floral touch. Thank you! Firstly I love both Earl Grey and Lavender and found this recipe on a trawl for interesting recipe. It looks like my idea of heaven… truly. Going to try the recipe this week! Whoop!!! I’d like to make an Earl Grey Ganache to make chocolate truffles… has anyone got a recipe please?! Its for my wedding in August! I have lavender growing in my yard; wonder if I could incorporate fresh flowers in this recipe. Or perhaps I should steep a handful of flowers in a small amount of water, and use in place of some of the buttermilk. I like the concept for this recipe–especially its inclusion of actual, ground-up tea leaves. (Just going by its title, I assumed the recipe would use brewed tea, the way some recipes call for brewed coffee or espresso). Earl Grey is also my favorite tea, so I will definitely have to try making this interesting cake sometime. Thanks! Huh. Should have read the other comments first–I see now that both Patti and Jen mentioned using fresh lavender in their posts. Never mind, and thanks ladies! The tip about infusing sugar with the flavor of lavender buds was especially helpful. I love chocolate fudge cake and earl grey tea never tried them together. Interesting concept, it must be a winner if your getting requests for it again. Making my mouth water as I speak. Cheers for the recipe. That is one hell of a cake! 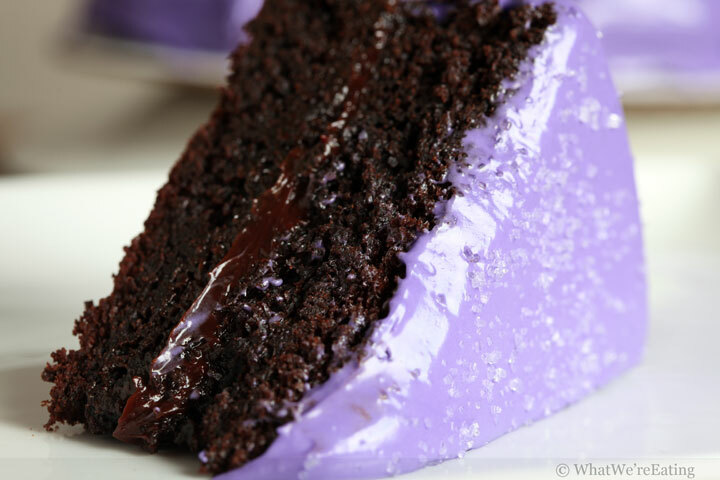 The texture is fabulous… fudgy… all good chocolate cakes should be fudgy. I’ve made ganache with violet sugar and the combo is amazing. Not such a lavendar fan but I would definitely try this with the violet. Just brought a fudge cake and had some tea, not sure if it quite the same as the two combined. Will have to give it a go at some point with our bread machine, apparently you can do cakes in it….we will see.